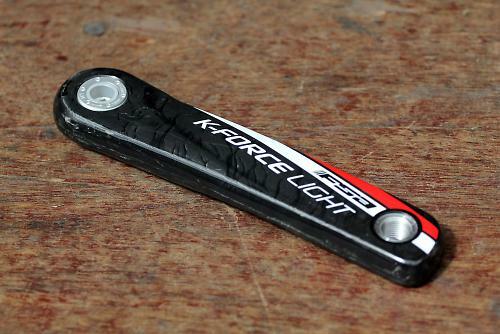 The K-Force Light BB386EVO is Italian company FSA's latest and lightest top-end chainset. It uses full carbon fibre arms to keep the weight low and a new 110mm BCD (bolt circle diameter) makes swapping chainrings real easy. It's also 10/11-speed compatible. This 53/39 version with 172.5mm arms weighs 649g with the bottom bracket. The chainset has been developed to be compatible with the wider 86mm bottom bracket shells with a 30mm diameter axle that FSA developed, and many of the latest road bikes are starting to use. Adapters deal with any compatibility concerns, it can easily be fitted to a regular PF30 or BB30 bottom bracket. To keep the weight low, the crank arms and spider are moulded in carbon fibre with hollow arms and a reinforcing rib to increase stiffness. The driveside crank has the 7075 aluminium axle co-moulded to the spider. Five T-30 Torx bolts thread into the chainrings from the inside, and the 5th bolt is concealed behind the crank arm. FSA call this Asymmetric Bolt Spacing (ABS) and the idea is to put extra rigidity where it's most needed in the pedal stroke. FSA have followed the same smart move as Shimano and Campagnolo in using a single (110mm) bolt circle diameter. That means changing chainrings is much easier. You could conceivably switch from a regular 53/39 configuration for racing to a 50/34 compact setup for a trip to the mountains. That saves the cost of buying a second chainset. The chainrings are 3D forged and CNC machined from 7075 aluminum, with the necessary ramps and pins to improve shifting performance. The chainrings are also 10- and 11-speed compatible which is useful if you're planning a drivetrain upgrade in the future. Out on the road the shifting performance was flawless. It was crisper and more positive than the SRAM Red chainset that the FSA replaced on the test bike. The configuration of the chainring bolts has provided a big leap forward in shifting performance, it's much better than previous efforts, and is a worthy rival even to Shimano's benchmark Dura-Ace. Did I notice any increase in stiffness when riding? Hard to tell really. The chainset it replaced was hardly a noodly thing but during the flatout sprints that typify a road race, there did seem to be a small measure of improvement in this department. Though marginal, there was definitely a bit more rigidity when really standing hard on the cranks. That extra stiffness doesn't come with a weight penalty, these are lightweight cranks. This 53/39 chainset with bottom bracket weighed 649g. 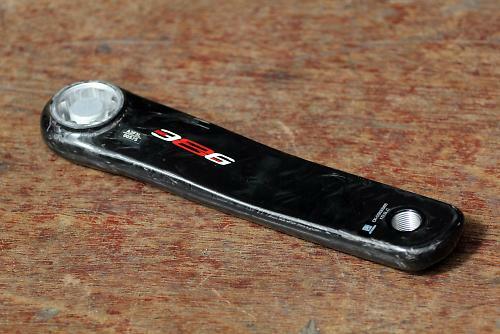 That's lighter than a Shimano Dura-Ace's claimed 683g. If you're a weight weenie, that weight difference could matter a great deal. A 50/34 compact chainset is lighter yet, at a claimed 594g. Fitting the chainset was easy. The supplied instructions are clear and easy to follow, the bottom bracket slips in, then it's just a case of making sure you fit the correct spacers if you need to. I fitted the cranks to a Cannondale SuperSix Evo frame, replacing a SRAM Red unit. A 10mm bolt tightens up the non-driveside arm onto the cranks and there's a wavey washer to preload the bearings. It's all very simple really. And I've not experienced any creaking sounds during the test. FSA have given the cranks a slick new finish, with unidirectional carbon and fresh new graphics. They're available in an all-black version as well. The test cranks are starting to show some signs of wear and tear: there are a few chips and a crash in a road race last weekend has added a few scuffs. Nothing out of the ordinary but they do appear to mark a bit more easily than some cranks. The FSA K-Force Light BB386EVO is available with 46/36T, 50/34T, 52/36T and 53/39T chainrings and 170, 172.5 and 175mm arm lengths. Clearly the FSA K-Force Light BB386EVO cranks represent an expensive upgrade and won't be for everyone, but if you are in the market for a lightweight high performance chainset with plenty of bottom bracket options and easy chainring changes, they're worth a look. The RRP is steep, but shopping around reveals there are discounts to be had, at which point they look a more appealing upgrade. K-Force Light BB386 represents the latest evolution of the carbon cranksets. Updated with contemporary graphics emphasize the racing and winning heritage of the model line. Would you consider buying the product? Maybe. Would you recommend the product to a friend? Probably. A fantastic high performance chainset with slick shifting and low weight that is comparable to the best chainsets on the market, but unless you shop around for a good deal, it's an expensive upgrade. They look "nice", but to be honest I like to have some proper exotica when I'm upgrading my bike. Could we drop this cheap and cheerful crap and get some high end kit up for review? HOW MUCH? You can buy a bike for that price! Obscene amount of money! So what are the chainring options for these then, are you limited to FSA's own or is the bolt spacing the same as, say, Campag? What, no triple? For that reason, I'm out! It'd be quite nice looking if it wasn't for the stupidly-large logo plastered all over it. I fail to see why I should pay extra to be a rolling advertisement. If anything, if it comes with a huge logo, you should pay less. Well having had two previous FSA sets that have failed... But also replaced by FSA for no charge. This is the latest one they have supplied as a replacement complete with ceramic bearing. Expensive ... well maybe but customer service second to none. Thanks FSA. And oh yes the latest one is fantastic thanks.